What caught my eye is that it plays with the typically less decorative parts of the plumbing system, the drain lines. As a kitchen and bath designer I strive to hide, conceal or blend in this "unsightly" portion of a kitchen or a bathroom, where as this artist is celebrating it! Through a little google image research, I discovered that while this first piece I was introduced to was simply decorative, The Hayward Gallery at Southbank Center in the UK actually has a commissioned working bathroom from the same concept for their men's restroom! Here in the United States, we try to avoid "unmentionables" especially when they concern our bodily waste. However, in asian countries, the toilet has been celebrated for years. Maybe that's why Toto is the leading manufacturer for high quality, low water consuming toilets? There is a Toilet-Shaped House in South Korea that was built to mark the 2007 inaugural meeting of the World Toilet Association, there has also been a slide and toilet exhibit in Japan for people to "experience being flushed" with spiral shaped brown hats on their heads at the National Museum of Emerging Science and Innovation in Tokyo. While this may not be the right fit for most of us, we should consider the full functionality of our homes. How long are you on your hands and knees wiping the crud from the base of your toilet? Are you hoping for a traditional pedestal sink or a modern wall-mount bathroom vanity? If so, how much of the drain/waste line (aka P-Trap named because of its shape like the letter) might be seen? What is in the cabinet below your kitchen or bathroom sink? Do those items need to be stored there? Are you adding functional drawers or pull-outs for stuff? Will you have a garbage disposer and chilled/hot water that will need some of that space to function? There are a variety of realistic solutions for every household. Maybe a wall-mounted toilet or a one-piece toilet with a "skirt" that covers the pathway of the toilet waste could be a better solution for a quick bathroom wipe-down? Possibly a decorative "Bottle-Trap" is the answer where waste lines may be visible in your remodel. Space efficiency and maximization is key in most Bay Area kitchen and baths. Working out details with your plumber early is essential to have as much storage inside a sink base cabinet as well as fitting critical design elements like disposers and other features like instant hot water systems or the Grohe Blue sparkling water kitchen faucet combo. How will your artistic sense influence your decisions, selections and soon to be beautiful home? Berkeley has a hippie mentality reputation even more than San Franciscans, but boy, those wonderful crunchy granola folks can have some great ideas for reuse! I was visiting a friend, who is also my bookkeeper, and she had found an awesome reuse solution for glass blocks! Yes, that stuff that was used in the 80's, instead of windows and walls, which provide privacy and solar heat in homes and offices all over the Bay Area. It's so simple, I'm surprised that I haven't come across it on Pintrest yet. She had one 10" block halved to make a leak free planter for her succulents. Perfect for a desk in need of a little freshly made oxygen. Some regions are known for their weather, hot and humid in Georgia, cold and snowy in Minnesota, and rainy and grey in Seattle. California is no different, we are simply "weather-less" to the minds of people from the more extreme regions. Especially in the San Francisco Bay Area, with our summer fog blowing in through the Marin headlands, past the golden gate up into the Berkeley hills and all our other microclimates, it is easy to forget the dry heat of the valleys, that though fruitful with crops can also seem like a dessert. In times of severe drought, California's governors have time and again called for conservation. Have you seen the EBMUD's (east bay municiple utilities district) billboards showing use of brooms instead of hosing the sidewalk? Have you heard the Water Sense radio ads for how boaters can save water so they can keep their boats in without getting stuck in the muck? Maybe you've even heard a Josh Donaldson of the Oakland A's recommending taking a "power shower"? So if conserving water is their problem, isn't it ours too? Hetchhetchy water tastes great, until we run out and need to use wells filled with minerals that discolor and leave hard to clean spots on our cars and shower doors and that has a disgusting taste like Hanford water. So what can we do? Commando Shower: Turning the shower on, waiting for it to get up to temperature, getting wet, turning off the water, lathering up while getting goose bumps, turning the water back on and fiddling around trying to get the temperature right again, rinsing off and being done in 5 minutes or less. Over twenty years ago a shower head was designed just for this purpose with a little "off" button on the shower head! Bucket Brigade: Having a bucket, or several, in your bathroom hoping not to trip over them, filling them with cold water as you wait for the hot water to reach you from the water heater that is located at the other end of the house, picking the heavy bucket out of the tub or shower being careful not to spill gallons all over your floor or drop the thing on your toe and then enjoying a nice warm shower... Repeat per person in the house because the water cools off in the pipes in the 15-20 minutes it takes for you to dry off, get dressed and other essential getting ready time. Let it Mellow: Applying only "if it's yellow", let urine and toilet paper sit and hang out in the toilet bowl for a few trips to the toilet, not enough to clog the system hopefully, then flush assuming your friends are friendly with this, otherwise expect them to flush or think your toilet may not be functioning and try to fix it for you, and scrubbing the toilet bowl more often due to bacteria that tries to make a new home for itself. Sink Capture: Hand washing dishes in a bucket and reusing the dirty water in their toilet and over time having a toilet that clogs regularly and flushing mechanisms not working. Some pour this water into their gardens, more appropriately, but find that pests become attracted to the washed out food particles. Hand-washing dishes in the sink: many homeowners all over the Bay Area are still hand-washing their dishes, some simply don't have a dishwasher, others find it therapeutic but most believe they are being Eco conscious. What they don't realize is that even if they are washing in a bucket and collecting dishes in a sudsy place, while they rinse they actually use more water on average than they would using a dishwasher! Dishwashers today have been designed to use very little water, not only can they reach the scalding germ killing temperatures that are impossible by hand, but they precisely spray the water where it is needed and use small effecient and powerful streams of spray that push the grime off. They also have integrated little garbage disposers in them so that the particles get grinded up and sent out so that they're not spread all over onto other clean dishes. Reusing all water is good: Water from the kitchen sink, and even washing machines especially for parents washing soiled diapers and changes of clothes is actually considered "black". Black water is a fabulous place for organisms to grow, hibernate and spread potential disease in food partials and grease. Grey water, called so because of its general coloring and lack of clarity, can be reclaimed immediately without needing to go to a major processing plant. This water may be from washing hands with environmental friendly soaps or using the washing maching with a regular cycle of clothes and can be used to flush toilets and water plants safely. There are elaborate systems plumbers can hook up to capture this potential waste and direct it to gardens and filtering collection tanks. There are also simple systems to connect bathroom sinks to toilets to avoide flushing potable drinking water directly down the drain. Basic: Water Sense and PG & E have a great websites with simple cost effective techniques that are safe and relationship friendly. What if you're already Planning to remodel? Select water saving fixtures and faucets start with dual flush toilets and low flow toilets, Toto has one that is 1GPF (gallon per flush)! How about the shower head? Yes, you can still feel luxurious as water rushes down covering your whole body, has enough pressure to rinse out your hair and saves water! No need for those commando showers boys! That being said, for those who like to turn the water off mid-shower, I recommend getting a thermostatic shower valve. This measures how warm the water is and maintains that temperature during your shower without losing pressure when someone in another part of your home runs the dishwasher or flushes a toilet. Shorten your wait time for hot water. Ask your plumber if an on-demand or tankless hot water heater just outside your bathroom, or even under the sink makes sense for your home and situation. Another cost effective option might be to use a recirculating pump which pushes the cold water from the hot water line into the cold water line until hot water is a few seconds from your sink or shower without changing the temperature of the water in your cold water line, it's a neat trick! I'm curious, how might your thinking have changed about saving water? Please add your comments. Bathroom safety is a designer's top priority with function and style running a close second. You may have heard the commercials saying "I've fallen and I can't get up!". Well, its a more serious topic than the silly commercials leave you to believe. Many seniors fall in tubs and showers and opt to sponge bathe for years rather than take a chance at being that person crying for help. The market is littered with ugly grab bars, suction-cup attaching things and other white plastic hospital style temporary safety stuff which gives bathroom safety a bad name. Its my job to tell you that grab-bars are not just for seniors! They are for everybody, and they don't have to be an eyesore to your newly remodeled home! I recently had a client in her 40's comment "you must think I'm old". In truth, I had not considered her age when I told her that I was recommending a grab bar in her shower. What I had considered was basic human experience. I use a grab bar every day, and yes, I'm only 36. It is easy to over heat ourselves while relaxing in a warm bath or under a hot steamy shower and become dizzy. When we have the flue, or simply don't feel good we are even more prone to needing a little assistance, whether it's to sit down or step out or simply shaving our legs. When I was pregnant, with our now 3.5 year old, I was even more sensitive and even kept the bathroom door open so that my husband could hear if I collapsed. It could happen to anybody. Have you ever stepped out of the bath only to accidentally grab the towel bar just to have it bend out and fall from being under very little weight? Have you ever stepped into the shower and grab onto the hand-shower bar? Of course, we all do, its a natural tendency. So why fight it? Now in my best "info-mercial voice" But wait, there's more! Style doesn't need to be sacrificed! Ginger Co, Watermark Designs, Delta Faucet and many other companies at all ends of the cost spectrum, have designed grab-bars that essentially match their towel bars. Check them out, reach out and touch them if you can, the Jack London Kitchen and Bath Gallery showroom in Oakland has just installed a couple of these beauties in their live bathrooms. You'll find that they have a larger diameter than the average towel bar but otherwise, they have the same mounting trim detail as the rest of the accessories for your bathroom. Ginger was one of the first to provide aesthetically pleasing designs, Watermark Designs has integrated their vertical hand-shower slide-bar into a grab bar to make it more useful and Delta has taken the next step and integrated an "assist bar" into their towel bars and even their toilet-paper holders! The term "Italian made" is considered a trademark for style, beauty and quality. In this case its funny looking, but apparently very popular. Fantini Rubinetti has brought back an original design with some "re-editing" from their line of "taps". Its the I Balocchi with its chunky cross handles in a rainbow of colors! These faucets are actually playing a major part in bring fresh water to those in need in Masango Burundi Africa through their "100 Fontane Fantini for Africa" campaign. This "pop-art" style faucet was first introduced in 1978. Starting in 2013 %100 of the profits from the sale of this collection will finance a new clean water fountain close to the villages so that children can spend their time in school and playing instead of carrying water. What sink size works best? This question was recently asked on Houzz.com. Choosing the best sink for you is what is most important. Ask yourself some questions. Do you like to hand-wash your dishes? Are you Left or right handed? Do you have a separate prep sink for washing vegetables? Do you need a separate sink for veggies? What is the largest pot or pan that you need to fit into the sink? Will it only fit into a single bowl? Would a lower center divide work for both fitting your pots & pans as well as having the separate space? What is the size of your sink cabinet ? Will a larger 50/50 (equally divided) work better than a smaller 50/50 version? If you don't have a large enough sink base for a equally divided sink, maybe one that is 40/60 (small bowl on left or right) may work better for your needs. One thing I can say definitively is that you should purchase the sink-bottom-grid for the bowl that will hold your dishes. It will keep them off the bottom which generally means that your large pots fit a little better, they won't block water from draining and your sink, as well as your dishes, will last longer without the extra scraping on the bottom. For more sink options described in this article, visit my Houzz ideabook. 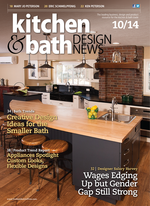 I'd like to write an article based on FAQ's regarding kitchen and bathroom remodeling.